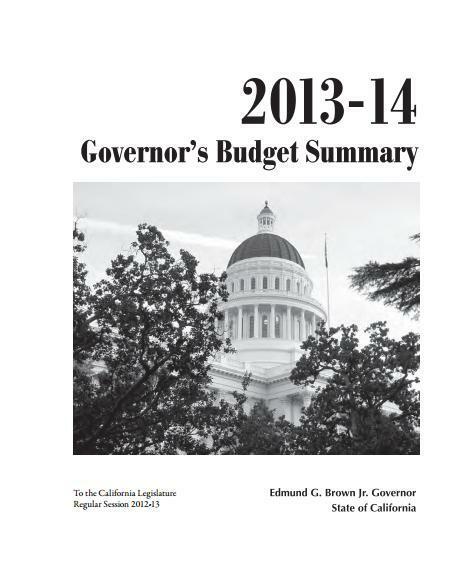 Here is some preliminary analysis of the governor’s budget proposal. Note that it is a proposal and not an enacted budget. Typically, the proposal is revised in May and not passed until close to the June 30 deadline. At the state level, the general fund is said to have had a negative balance of $1.615 billion as of last June 30. The governor is proposing and forecasting that at the end of this fiscal year (2012-13), there will instead be a positive reserve of $0.785 billion. That swing tells you that he is projecting a surplus this current year (inflow > outflow) of $1.615 billion + $0.785 billion = $2.4 billion. For the fiscal year 2013-14, he wants the reserve to rise to $1.636 billion. So he is projecting a surplus of $0.851 billion. In short, the surplus this year is to be bigger than next year’s. For higher ed, the governor has a lot of language that was already noted in prior posts on this blog about efficiency, holding back tuition, and more use of online education. He spent much time at the media conference at which the budget was presented on higher ed. When you cut through everything, in nominal dollar terms the general fund allocation to UC rises by $279.1 million or 10.9%. $125.1 million of this is said to be for core instruction which includes $10 million the governor wants to go for online education. Another $125 million is said to buy out a tuition increase. Of course, it buys out a tuition increase of precisely $125 million, no more and no less. Tuition and fees right now are about $3 billion so it in fact buys out a tuition increase of a little over 4%. (Since those two items add to less than $279.1 million, there is some added money for other things. There is some language about shifting money for capital project debt service to the general fund, so that may be the discrepancy.) There is language about limiting the amount that UC can spend on capital projects in the future. Presumably, but not surely, that language refers to state-funded capital projects. Again, clarity is lacking. The budget document states that the past practice of budgeting by enrollment doesn’t promote efficiency. The governor wants targets achieved such as more community college transfers, faster time-to-graduation, etc. But it isn’t clear exactly how the funding in the budget aims at those targets. Nor has the state been closely adhering to enrollment in budgeting for UC in recent years. In short, although there is much more in the budget document about K-12 reforms in budgeting, the governor sits on the Board of Regents and is likely to be disproportionately active at UC. Up to now, the Regents have generally been in the mode of profusely thanking the governor, supporting Prop 30, etc. How they will react to his continuous presence (quite different from his predecessor) remains to be seen. Previous Previous post: A Shake for Higher Ed in the Forthcoming State Budget?